Treasures are hiding behind the shells, don’t you want to get them? Open the shells, match one pair of items then you can earn them as a prize! And you can also get points by opening shells. Collect points and win mounts and many more rewards! 1.Each turn there will be 8 pairs of items hiding behind the shells. Match one pair of items then you can earn them as a prize. 2.Opening shells costs shell points, which can be bought buy diamonds. And using 1 shell point will win 10 points. Points can be used to buy items in the points store. 3.At 8:00, 12:00, 16:00 and 20:00 of everyday, we will send you 8 shell points. Remember to collect it in time, if not you can not collect it when expired. 4.There will be two kind of reward mode, Random Pick and Manual Pick, which can be chosen by yourself. In the Random Pick mode when you open the shells, items appear randomly, while in the Manual Pick mode you can spend diamonds to select items as you like. 5.In the Manual Pick mode, click the REFRESH button then the items you have selected will appeared in next turn. Description: Reach certain Points in Beach Treasure everyday to collect the following bonus! 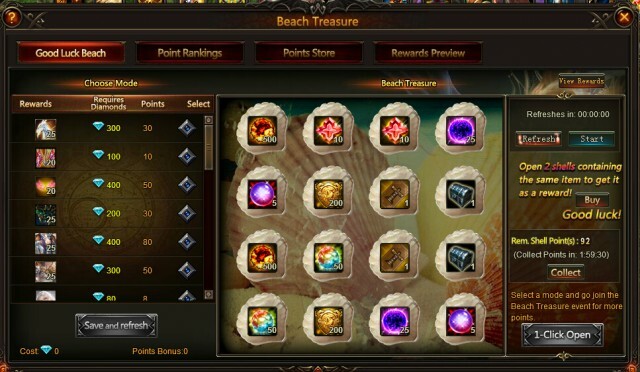 Description: Get higher total points in Beach Treasure and win better rewards! Description: Log in every day to win Shell Point Card (10 Pts) and other items! More exciting events are coming up through Mar 30 to Apr. 1, check them out in the in-game Hot Events menu now! LoA_Capsule Toys: Get Combo Rewards and Win Snow Queen! LoA_Fire Queen in Cross-server Resource Tycoon! LoA_The 9th Cross-Server Team Tournament Coming Mar. 15th!